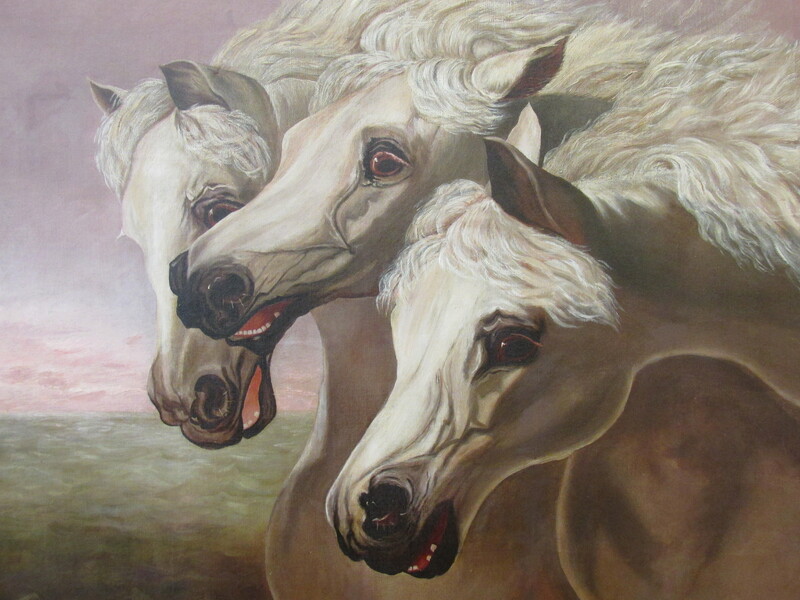 “The Pharoah’s Horses” is an 1848 work by British painter John Fredrick Herring Sr. In partnership with our good friends at Palm City Art and Frame, Alchemy Fine Art Restorers worked on a well-executed, but damaged copy of this famous image. 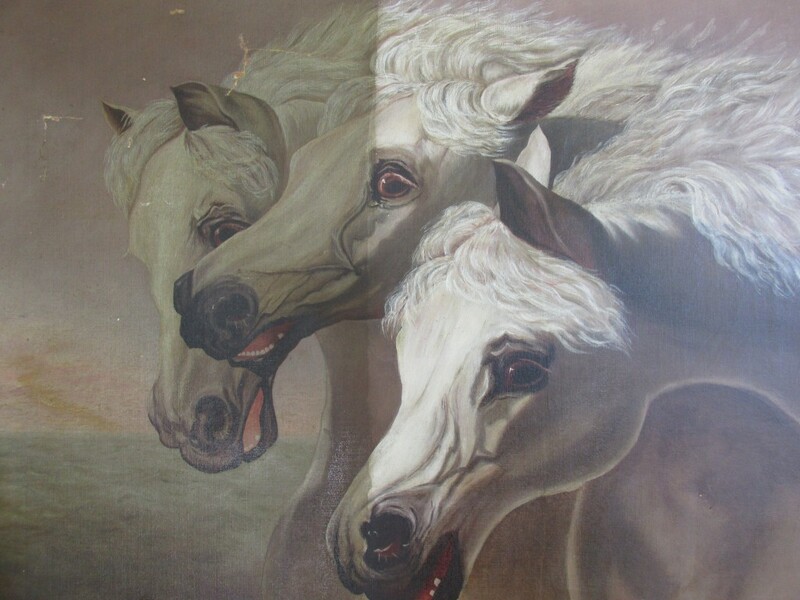 The owner of this damaged painting knew it was a copy, but appreciated the work as a decorative piece, as he should have. Such popular images are frequently copied by students and admiring amateurs. Typically, there is no intent to deceive. Rather, these works are used as teaching tools by the aspiring artist. In this case, the painter was a relative of the owner. 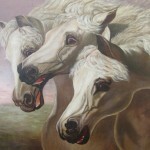 “The Pharoah’s Horses” is one of the most popular images of all time! It has decorated countless parlors for over a century and is a popular tattoo. Antiques Roadshow lists it as one of the most copied paintings. In fact, it was once so ubiquitous that it is included in the background of Norman Rockwell’s “Solitaire” (1950). Does this mean a copy is always worthless? Perhaps not. A year after Herring’s work sold at auction for almost half-a-million dollars, a man bought what he thought was a copy for $25 at a Missouri flea market (1987). 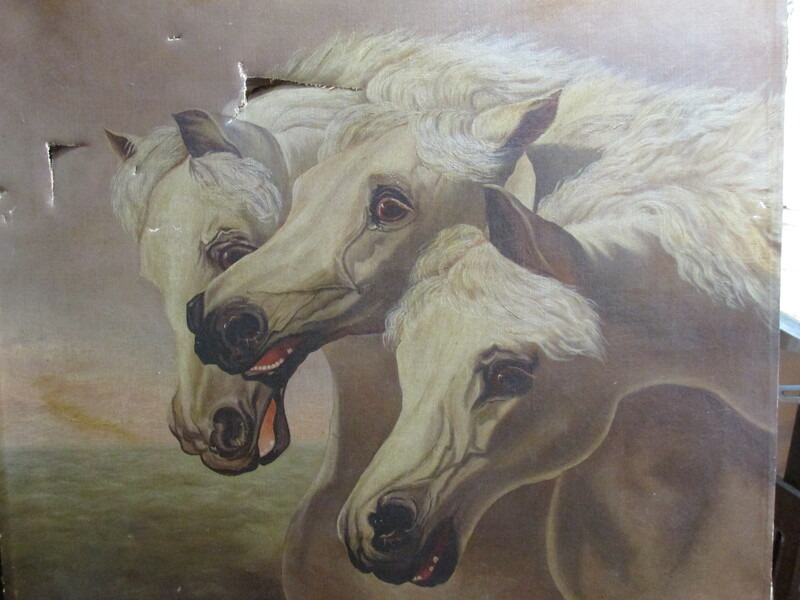 After painstaking research into the paint and canvas chemistry of this flea market find, it was postulated that the Herring painting might itself be a copy of an earlier work. Suddenly, the flea market copy was the original and the original a copy! Alchemy Fine Art Restorers can’t determine which was original without examining the paintings first-hand, but you have to admit, it’s an interesting story. The damaged, dirty painting. The canvas was torn in multiples spots. Cleaning in progress, showing half and half. The fully restored and cleaned Pharoah’s Horses.